Syriza election win: Is Greece heading for the door? 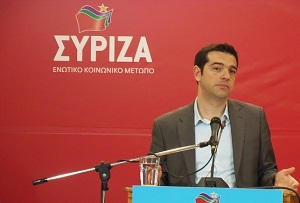 European policymakers are biting their nails after Alexis Tsipras's radical-left party won the Greek elections. The dust has settled on the Greek elections and we now know the country will be run by an anti-austerity coalition led by the radical left-wing party Syriza. Now the speculation begins about what this all means for the Eurozone, and for Greece's place within it. Syriza has primarily campaigned on a platform of writing off swathes of Greek debt and renegotiating the conditions of the country’s bailout, which it has been tapping into since the proverbial hit the fan in 2010. The 'troika' of the IMF, the European Central Bank and the European Commission imposed harsh austerity measures on Greece, stoking resentment between the country’s citizens and the likes of Germany. The new ruling coalition is formed of Syriza and a right-wing populist party called Independent Greeks. Besides opposition to austerity the two share very few political leanings, suggesting there's not much on Syriza's mind but solving Greece's debt situation. Tsipras, who at 40 years old will become Greece’s youngest prime minister for 150 years, has said the prospect of Greece leaving the Euro ‘simply does not exist’, and the Greek public strongly supports remaining in the union. The rest of the EU doesn’t really want to see a Grexit either – a reversal of integration would challenge the viability of the EU itself. But circumstances could force their hands. Like any good politician, Tsipras wants to have his cake, and eat it too - to stay in the Euro but on his own terms and with a big chunk of debt written off. But the gap between what Syriza wants and what the rest of Europe is willing to give now looks more like a chasm. Greece’s creditors have been adamant there will be no write-off, but some have conceded that restructuring will be enough. Tsipras will have to hope that a less radical version of what he has been promising is enough to sate the demands of the public, and of his more radical fellow party members (including card carrying communists) – some of whom have already called for Greece to go it alone. While compromise looks like the most likely outcome, Greece's rejection of the orthodox austerity approach and the mere hint of exit has put the wind up the world of finance - the Athens Stock Exchange index is down almost 4% this morning and the Euro hit an 11-year low of $1.1088. Stay tuned for more turbulence.